One of the reasons why Narendra Modi swept to victory with a historic mandate in 2014 was his combative and upbeat oratory. Three years on, the Indian prime minister is beginning to sound unusually defensive. Many say Mr Modi's characteristic bluster and bombast have begun to wane. In recent speeches, he has described his critics as doomsayers, blamed the previous Congress government for India's economic ills, painted himself as an "outsider" and said he was "willing to drink poison" for the good of the country. Has the victor turned victim? "A small number of people weaken us," Mr Modi told a gathering of company secretaries recently. "We need to recognise such people." So is Mr Modi beginning to lose his mojo? Three years ago, when he won his landslide, he promised reforms and jobs. But under his leadership - and at a time when the world economy appears to be taking off - India is looking like a sorry outlier, battling an economic slowdown and a jobs crisis. Has Narendra Modi lived up to expectations? Is Narendra Modi's government unravelling? Banks are struggling with mountains of bad loans, which in turn has choked credit and hurt domestic investment. "India's economy is grounded," says economist Praveen Chakravarty. Mr Modi's response has been criticised as piecemeal and clumsy. A controversial currency ban last November, politically sold as a crackdown on the illegal economy, ended up halting growth and causing a lot of misery. July's introduction of a much-lauded countrywide Goods and Services Tax (GST) to help India move towards a common market has caused widespread business disruption because of what is seen as shoddy execution. In cities and towns, traders are upset over the grinding tax bureaucracy engendered by the GST. In villages - nearly half of Indians are engaged in agriculture - farmers are complaining of income insecurity as they believe the government isn't paying them enough for their produce. Also, for the first time since winning power, Mr Modi's government is under attack. A senior functionary from Mr Modi's party, the BJP, recently blamed his government for the economic slowdown. "The prime minister claims that he has seen poverty from close quarters," former finance minister Yashwant Sinha wrote. "His finance minister is working overtime to make sure that all Indians also see it from equally close quarters." And Mr Modi is taking flak from the opposition too for a change. His main political rival, Rahul Gandhi, of the once mighty Congress party, appears to be suddenly re-energised and has been taking on Mr Modi more aggressively than ever before. Added to this, the son of Amit Shah, Mr Modi's closest aide, is accused of corruption. Jay Shah denies the allegations and has threatened to sue non-profit news website The Wire over the story. Thus far since taking office, Mr Modi has been greatly helped by four unrelated things. Low oil prices - India imports most of its crude - helped boost growth and tame inflation. Second, a chunk of the domestic mainstream media which depends on government advertising has been largely uncritical of his government. Third, Mr Modi faces no leadership challenge from within his party, which he and Amit Shah dominate. Lastly, and most importantly, a political opposition largely in disarray has failed to offer aspirational Indians an alternative - and persuasive - narrative of hope. Still, there's "something in the air", as Shekhar Gupta, editor of The Print news site, says. One indication is that even Mr Modi's fiercely pugnacious supporters are markedly subdued on social media these days. On the other hand, social media is awash with memes making fun of the prime minister. Mr Modi's politics are also causing discontent. By whipping up what many say is hysteria over the sale and consumption of beef and pandering to Hindu radicals, observers say his party has begun to frighten off many young people and urban folk. To make matters worse, his party appointed a controversial Hindu religious leader known for anti-Muslim rhetoric to run the political bellwether state of Uttar Pradesh, where the BJP won a decisive mandate in March. About a fifth of Uttar Pradesh's 200 million people are Muslim. In 2014, Mr Modi secured the overwhelming majority of the young votes. But is support from this quarter waning? BJP-supported student unions have lost elections in three major universities in Delhi and Hyderabad. Last month's unrest in a leading university in Mr Modi's constituency in Varanasi, in Uttar Pradesh, where police beat female university students protesting against an alleged sexual assault, will not endear him and his party to young voters. On the economy, Mr Modi clearly seems to have overplayed his hand and questions are being asked over whether he can fulfil expectations. In June, the Economist said Mr Modi was "not the radical reformer he is cracked up to be". The magazine said he had few big ideas of his own - the GST, for example, had been initiated during the previous, Congress, regime. 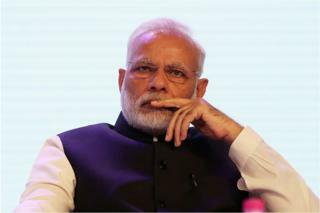 Critics say despite running India's most powerful government in recent history, he has achieved little in creating functioning markets for land and electricity, and reforming labour laws. On his politics, they say, Mr Modi appears to be hostage to the party's ideological fountainhead, the right-wing Hindu nationalist Rashtriya Swayamsevak Sangh (National Volunteers' Organisation), known for what many say are visions of Hindu glory and achievement. Economists such as Dr Chakravarty believe Mr Modi still has time to revive the economy by exploiting the buoyant stock market, which is flush with money from foreign institutional investors. Money could be raised by divesting stakes in state-run companies and used to recapitalise and clean up the ailing banks, so that they can begin lending again. Also the rupee could be depreciated to boost exports, the GST simplified further to help small businesses and interest rates lowered to spur growth. Growth will also depend on social stability, but it is not clear whether Mr Modi will be able to rein in the radical hotheads. However, Mr Modi is a redoubtable fighter. It is too early to say the tide is turning against him decisively. One opinion poll in August indicated he would win handsomely if elections were held. But then again, a month can be a long time in politics. State elections in BJP-ruled Gujarat in December will offer some clues - a recent survey by the Centre for the Study of Developing Societies (CSDS) suggested people were "unhappy with GST". Nobody expects the BJP to lose, but the margin of victory will be closely watched. Among his supporters, Mr Modi enjoys a reputation of being a hardworking and honest prime minister. "What has helped in stopping this wind of dissatisfaction from turning into a strong hurricane are two factors - the absence of a viable alternative, and the personal credibility of Mr Modi," says political scientist Sanjay Kumar. "The only question that remains is: how long will Mr Modi be able to hold down this wave of resentment with his own image and credibility?" And right now that answer is blowing in the wind.